Today we have an interview with Vivek who placed 3rd in our latest Adonis Index Transformation Contest. The topic of this interview is muscle gain and how quickly it can happen. Make sure you set up good lighting or book a studio for the shoot. This is the second time Vivek has placed in one of our contests. To make matters more interesting, this is Vivek’s first year of weight training. After the first contest, Vivek was very lean, however, his muscles were still undefined and his abs weren’t visible. For the second contest, he chose to focus on muscle gain; ensuring that any future weight gain would be from muscle and not fat. He followed the Main AI 3.0 workout for the contest followed by MBF. He also recorded his DEXA scan measurements every four weeks to track his progress. His training efforts yielded a steady increase of 1-2 pounds in lean body mass every month during the contest itself. Unfortunately, despite Vivek’s progress, he developed tennis elbow and had to stop training to recover completely. However, he continued his DEXA scans and observed that there was no change while he was receiving from the elbow issue, which is proof that muscle growth doesn’t occur when your body is resting, but only as a response to training (like some so called “experts” would have you believe). Your muscles remain in an anabolic state because of the work performed and not your protein intake. All that matters is the amount of work you did on that muscle group. With this realization and experience, Vivek decided to do 10 workouts a week. Why? Simply because more work equals more muscle. For his morning routine, he did the Hyperthrophy and Strength modules from the main workout; in the afternoon, he chose Strength Endurance and Specializations for his weaker areas like abs, chest or hamstrings. Lots of people do some kind of cardio in the afternoon, however if you take away the health benefits, then you are really doing it for the calorie burning, so why not add some weight training instead since the usual cardio doesn’t stress the muscles? And the bonus is that you will still get some health and conditioning benefits from the Strength Endurance workouts too, so it’s kind of win-win. Vivek doubled the work, made sure he followed the rest periods and took DEXA scans every four weeks to track progress. Did double the work translated into double gains? In the first month of doing this he gained 2.9 pounds of lean body mass, he kept doing that for another month and he gained another 3 pounds. This was after the contest, but still part of his Adonis transformation and the results are just astounding. And Vivek is not the only one who tried doing the workouts more often, one of our previous contestants Adam Murphy did the same thing. Now, should you also work out twice a day? Well, the answer is “It depends”. If you are just starting out then the regular program as it’s laid out will be more than enough, also if you follow one of the more advanced protocols from the Adonis systems, then you won’t be able to add much more on top of that. But if you went through the AI workouts at least once and you are familiar with how they work, then you can play with it, and maybe just like Vivek, do two per day instead of one, well at least if your lifestyle allows you to do that. Ice Cream as Pre-Workout Meal? Vivek has a pretty unique pre-workout routine. He likes to grab an ice cream, for no other reason than that he enjoys it. Now if we take the regular ice cream that Vivek gets it’s roughly only 150 calories (about two apples worth), so no big deal, but he was driving people nuts in the gym. Imagine everyone pounding protein shakes and pre-workout drinks and then Vivek walking in the gym at less than 6% body fat and ice cream in his hand. What they didn’t realize was that their shakes probably had more calories than his small ice cream. The point is, you can eat whatever you want. If you keep some balance in your diet and limit the amount, then there is no reason why you couldn’t have an ice cream before your workout. Forget about the bad foods goods foods dogma and focus on the basics that really matters. 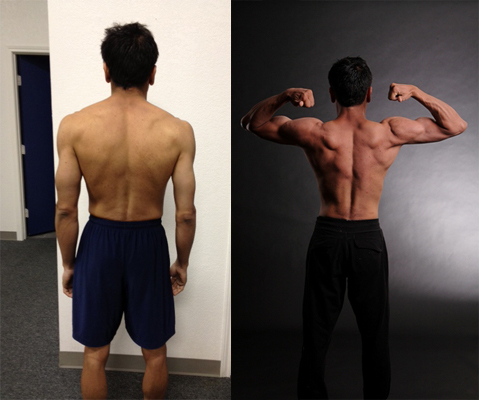 Vivek’s back muscle development over the months. Once you are at it and doing the photoshoot, make sure you take some pictures with your casual clothes, those photos can be handy. Competing in AT7 was essentially the challenge of increasing muscle mass while still keeping my fat mass low. I had lost a lot of fat and had very low body fat percentages by the end of AT6.